College plan for PacMed in trouble; apartments instead? 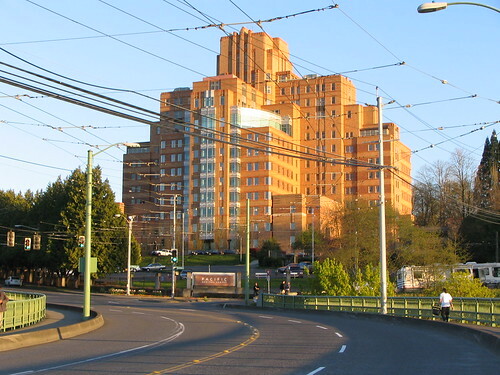 The Seattle Times reports tonight that the state Department of Commerce has rejected the proposed lease agreement that would have put Seattle Central Community College health-training programs and other non-profit agencies in the 1932 Art Deco landmark PacMed building, which most recently housed the Amazon corporate headquarters. The public authority that owns the building, the Pacific Hospital Preservation and Development Authority, proposed a 30-year lease that would require the state to provide $250,000 in exchange for 60 more days to conduct due diligence evaluation of the building’s condition. The state would prefer 90 days to conduct its due diligence. The PDA’s governing council has said that if the state did not agree to this lease by Monday evening, they would turn to “other lease alternatives.” The other lease offer on the table is from Lennar, a Miami-based homebuilder that offers a 75-year lease with $25 million in improvements to create 165 market-rate one- and two- bedroom apartments, a gym, and a dining lounge. The Seattle Central Community College plan, funded with $20 million approved by the Legislature, would use 85,000 square feet for health-training programs, including a new Bachelor of Nursing degree. Non-profit groups focusing on community health would take up the remaining floors of the building. Funds from renting the PacMed building are used for the PDA’s mission, which is to “champion effective health care for the vulnerable and disadvantaged in our community.” The PDA plans to meet at 9 a.m. Tuesday, July 30, to discuss their next steps. Added 11:21 p.m.: If you want to let the Pacific Hospital Preservation and Development Authority know your thoughts on the current situation, contact Rosemary Aragon, the Executive Director of the PDA at r.aragon@phpda.org or by mail to 1200 12th Ave. S, Quarters 2, Seattle, WA 98144. She will forward your letters to the members of the Board. i believe it is a disappointment to many, to have the state turn down the option of Seattle Comunity College using the Pacific Medical Tower for a college medical learning center versus the PHPDA’s other option of what may be low cost housing. Of course the PHPDA wants to receive the most revenue it can to continue the wonderful work they do as a non-profit medical center for everyone. The Lennar lease is for 75 years plus options for 20 more. than have a stable college venue, for medical training,etc, which is sorely needed to alleviate the shortage in the medical field. “Last week Aragon criticized the state for taking too long to finish its due diligence. On Monday , Brian Bonlender, the Commerce Department’s director, disputed that characterization. Apparently PacMed, which has been working much, much longer with Lennar (the private company from Miami) to negotiate a lease and seems oblivious to the RCWs and WAC that the State must adhere to in entering into a long-term lease — after all, it is the taxpayer’s money and they must follow State law and guidelines in entering into a lease. If PacMed wants the State to sign a blank check without providing full, complete, and accurate disclosure, I would say they are not bargaining in good faith. income community is a failure of our City leaders to lead. It shows a lack of organization, momentum, and prioritization. Why can our Mayor and City Council spend staff time advocating for a sports stadium, or building development in South Lake Union and they can’t advocate for building a community college in Southeast Seattle? It shows a lack of urgency, education, and know-how in working on issues of importance for poor and minority communities. This project is about well-paid jobs, building a culture of professional middle-class opportunity, role-modeling secondary education, changing cultures of poverty, and all the other components that people living in Southeast know to be important. No project that moves these goals forward should be allowed to fail, and that is the attitude that our City leaders need to take on this. Failure should simply be unacceptable. Yes, the PDA for Pac Med and the State are in charge, but that doesn’t mean the City can’t be dogging them both to do the right thing, adding more incentives, working the phone lines and e-mail, using staff time to follow the financials and wording of the contracts, pushing with the County to make the deal happen. These are things all politicians do when a project is important to them. Unfortunately, neither the two City leaders running for Mayor, nor the State elected running for Mayor have done this work. If the Mayor is willing to call for wage parity at Whole Foods he should also be using the zoning laws to ensure the success of the community college proposal. Where is Bruce Harrell, our supposed SE advocate? And there is no excuse for the other City Councilmembers to be absent on this issue either. Sally Clark has stated on her website that a community college would be a great thing for SE. I haven’t heard any word of activity from any of these leaders. For the alternative housing project to become reality in this building, a City zoning waiver would be required. If that waiver is denied, the housing option is dead. This would force the PDA to take a closer look at the community college proposal. Sally Clark and many of our other electeds know these zoning laws well. Sadly, Seattle is a liberal City that lacks gumption, go-to-it energy, and drive on behalf of the poor. Our leaders are often lackadaisical, waiting for someone else to lead. This is exactly how important projects like this fall between the cracks. It is not a new story. So, neighbors, burn up your e-mail and phone lines. Let people downtown know this lack of drive and work on our behalf is unacceptable. The Mayor and City Council staff and resources belong to all of us, not just the rich neighborhoods. Our elected officials and their staff are paid well and need to work hard or move on. And those people are paid to work in August too, contrary to what one might think! Vote yes to elect city council representatives by district. I don’t believe that citywide council elections are to the advantage of SE families. The failure of a project as important as this shows exactly why we need locally elected City Council members. I don’t know who Freddie is, but his views are very valid. College medical plan put forward. It is indeed the object for the non-profit PHPDA to make choices that brings them the most revenue. It also remains to be seen what the hugh home-building proposes in their 75+ year lease. Further, will they provide all the care necessary to keep these structures up? I and the 50 plus people at the meeting were in accord with the College plan ,which would be a structured plan of college classrooms, and students and others would be coming there daily for only one thing, to be taught. Again, it is up to the PHPDA to approve that lease plan or not. Lennar will turn it into an adult care facility that allows people to “age in place.” Pure apartments are not allowed in a commercial zone, and that tower and the north lawn are zoned for commercial uses. Why do you think there’s a dining facility as part of their project? As the article stated, the Seattle Times reported that the project would be market-rate apartments with a gym and dining lounge.